The 31-year-old forward made a shock loan transfer to Barcelona on Monday from Serie A side Sassuolo until the end of the season with the option of it becoming a permanent deal this summer for €8m. Barcelona’s decision to sign Boateng came in light of Munir El Haddadi’s departure to Sevilla earlier this month with Paco Alcacer leaving Camp Nou last summer for Borussia Dortmund. This had left Ernesto Valverde’s side short of centre-forward options with Luis Suarez bearing most of the workload this season. Now Barcelona have confirmed that Boateng has been named in a 19-man squad for the trip to the Ramon Sanchez Pizjuan. The unsettled Denis Suarez, who has been heavily linked with a loan move to Arsenal this month, has been left out of the team for tonight’s first leg quarter-final clash. Also missing is Lionel Messi, who has been handed a rest by manager Valverde in favour of giving some academy stars like Riqui Puig a chance. 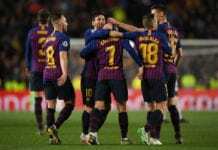 Speaking ahead to the tie on Tuesday evening, Valverde warned his Barcelona team to not lose their focus as they chase a fifth successive Copa del Rey title this season. 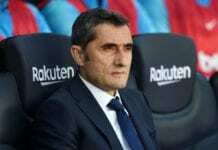 “Our analysis was based on the fact that they are a strong rival at home and in the knock-out ties they have always been very solid,” said Valverde in a press conference. The last time these two sides met in the Copa del Rey came in last season’s final, which saw Barcelona thrash Sevilla 5-0 at Atletico Madrid’s Wanda Metropolitano to claim a 30th crown.